Will Tooth-Colored Brackets Match Your Smile? Often, we talk to patients that put off treatment for their uneven smiles, for years in some cases. However, we offer cosmetic orthodontics to help Fort Worth, TX, residents obtain even and healthy smiles. 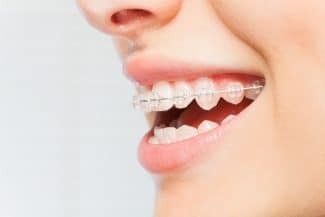 In today’s blog, we’re looking at how tooth-colored brackets help metal braces stay much less noticeable, while also improving oral health! Did you know that in some cases, misalignment leads to a greater risk of tooth decay and periodontal disease? When teeth sit unevenly or crowd each other, this provides places for food particles to become trapped. Even brushing and flossing may not be enough to remove these bits of food, which bacteria break down. In the process, oral acidity elevates and the teeth become coated in plaque buildup, weakening tooth enamel and inflaming gum tissue. Other times, misalignment causes a bite imbalance. The ruling malocclusion could place inordinate pressure on your jaw joints, leading to a greater risk of TMJ disorder and bruxism. These disorders could lead to headaches, jaw pain, and potentially even damage your teeth. Fortunately, orthodontics allow our team to correct your smile and prevent these oral health impacts! 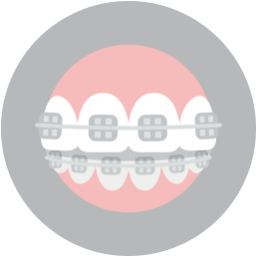 Braces involve placing brackets on the front facing sides of the teeth. We connect an arch wire to these brackets and by adjusting tension in the wire, move the teeth to more optimal positions. In order to make them more lifelike, we opt for ceramic brackets over the more common metal variety. 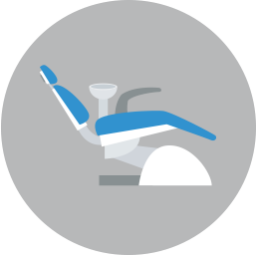 Ceramic is a powerful material, used in crowns and dental implant restorations. We can shade the material to match your teeth and ceramic also contains stain-resistant properties. Once in place, this minimizes the appearance of metal, as only the incredibly thin arch wire is visible. Patients with serious misalignment often need braces to correct their smiles. However, for those with more minor cases of poor alignment, we may be able to create a series of clear aligners from a special plastic material. 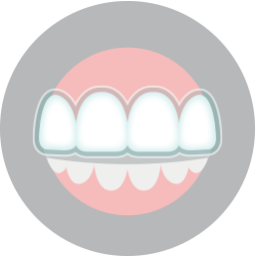 Invisalign® aligners will be worn daily to reposition the teeth and improve alignment. Whether you have minor or advanced cases of misalignment, we have a solution that doesn’t mean living with a mouth filled with metal. Talk to our team about possible orthodontic solutions and let’s obtain a straighter, healthier smile in 2019. Don’t let concerns about your appearance prevent you from improving your smile with orthodontic solutions, such as tooth-colored brackets. To schedule your consultation and discuss our barely visible solutions to misalignment, please call Lake Country Orthodontics in Fort Worth, TX at (817) 236-7846. Our office proudly serves patients who live in White Settlement, North Ft. Worth, Springtown, and all surrounding communities.